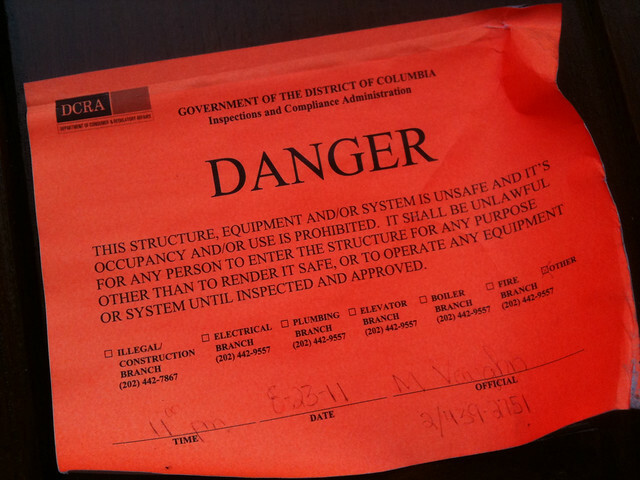 New Columbia Heights: More earthquake damage in the neighborhood than originally thought? More earthquake damage in the neighborhood than originally thought? As we all remember, we had that crazy 5.8 earthquake back in late August. There didn't seem to be much damage, at least in our area: a couple bricks here or there, some cracks in plaster. The Washington Monument was damaged, some gargoyles fell off the National Cathedral, but that was about it. We seemed to escape widespread damage. However, the more I read and see, the more damage seems to be out there. There was the Mt. 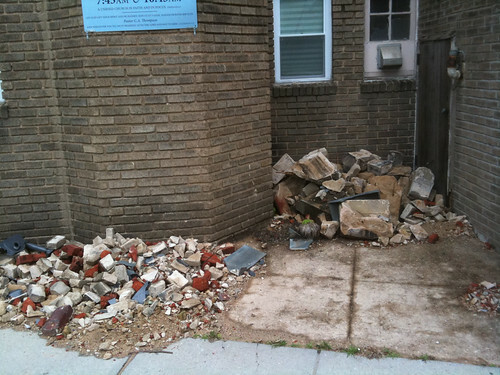 Rona Missionary Baptist Church at 11th and Monroe had lost some bricks, which didn't seem like a big deal. However, I walked by the other day and they had signs on the doors saying it was off limits no one was allowed inside because it was unsafe. Houses seem to have issues too: A week or so ago I was at a house party in the neighborhood and noticed that the door was hard to open and close, it was grinding along the floor. I asked somebody and it turned out the place shifted on its foundation a bit, and entire doorframe was bent. A coworker was living in a group house and the landlord recently told them it was condemned due to the earthquake and they had to leave. Pretty crazy stuff. I also just saw this notice on the Ward One listserve, which talks about damage at the Ella Jo Baker Cooperative, an affordable housing cooperative at 14th and V. They suffered about $15,000 of damage to the building, which caused 3 of the residents to have to move out. They're having a fundraiser for the repairs. Let's hope they get it. So maybe there really has been a lot of damage, we just didn't hear about it or see it at first. Anyone else notice any damage around the area, or even to your own house or business? Below is another shot from the Mt. Rona Church. Its been since August and they still have bricks and stones laying all over the sidewalk. Tear the place down already and put some nice condos in. Our carriage house (build around 1919) which now functions a garage was damaged at 1229 Euclid. A wooden support beam in the dealing came out of the brick wall. We had to get it repaired, or our roof would have fallen in. 11th Street Halloween Extravaganza tonight! Are you giving out candy? When? Want an oceanfront Columbia Heights apartment?